Sure today's Microsoft E3 keynote was jam-packed full of high octane explosions, but the biggest excitement from the hardware-free event was arguably SmartGlass, a new technology from Redmond that promises to help to bring together users' diverse array of screens. When it was initially leaked ahead of the event, SmartGlass looked to largely be a somewhat straightforward AirPlay competitor. Judging by Microsoft's flashy demo video, however, the company is clearly looking to build it into its own beast all together. Thankfully, we got to play with it a bit -- albeit for a very short amount of time, given the fairly early state of the technology. Let's start thing off by clarifying a big question surrounding the somewhat enigmatic demo that we saw at today's event: yes, SmartGlass gives developers the potential to turn smartphones and tablets into a controller for the Xbox 360. As suspected, it will likely be integrated into more casual games -- after all, we shudder at the thought of controlling, say, Halo 4 using just a touchscreen. As is the nature of the product, the company isn't letting the details flow too freely here, but in a demo we saw of the technology tonight, a Microsoft rep name-dropped a title called Home Run Stars -- a baseball game, as you've likely already gathered from the fairly straightforward name. We didn't get to see the game in action, but the rep mentioned a gameplay scenario in which one player uses the Kinect to bat and the other pitches with the touchscreen -- again, not too dissimilar from the kind of dual-screen gaming we've seen with the Wii U thus far. And you can also invert that game play, if you so choose, pitching on the Kinect and batting with a tablet or smartphone. Thing is, Microsoft is looking to make this whole process open for developers. As the rep put it, "what we've done is create a platform." In other words, Redmond is putting forward the tools here and letting the content developers play around, to come up with their own functionality based on SmartGlass. While the baseball title was more in the talking stages tonight, we got the see SmartGlass in action with a couple of demoable titles, including, most notably, Ascend: New Gods. 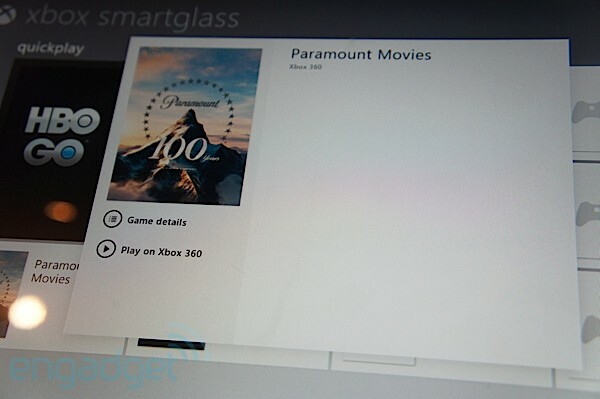 Get the game rolling and the title will pop up on your SmartGlass-enabled device. When it doesn't have tailored information to display, the device goes into "listening mode," essentially awaiting the game to give it its next set of instructions (via WiFi). The key functionality in this demo was a map. The question of what one does with a SmartGlass device while playing with a standard controller was answered, in this case, with "you put it on the table in front of you," so you can play the game and glance down at the map every time you need to figure out where you're going. Once the player left the cave, the handset switched back into listening mode. When confronted by a boss, it switched gears again, offering up boss stats, so you know whether it's time to fight or to run, based on your own status. Again, this is all about augmenting your gameplay. Microsoft also showed off an as-of-yet untitled karaoke game, again displaying a whole new set of functionality. Here, the SmartGlass-enabled device essentially gives other players something to do while you're singing your heart out. The device more or less turns into a karaoke remote. You can scan song titles and lyrics, and when you land on a track you like, enter it into the device and it will show up in a queue on the screen -- just like a real karaoke joint, without the two drink minimum. Naturally, SmartGlass isn't just about gaming. Movies and TV also serve as a key component. Microsoft once again trotted out Game of Thrones as part of tonight's demo. The HBO series does serve as a great example of the technology's potential, helping viewer get insight into the show's fairly complex mythology. You can view a map and get additional content like cast information and commentaries from the directors and writers. You can also check out the detailed character genealogy and episode timelines, in case you get lost. For the movie, the company gave us the Jack Black vehicle, School of Rock. Here you can get character info based on a given scene. Characters will pop up on your mobile device as they enter and leave. You can also skip ahead with a scrolling layout, picking and choosing scenes based on characters. And, of course, you can watch a video on your tablet and pick up where you left off on the big screen. 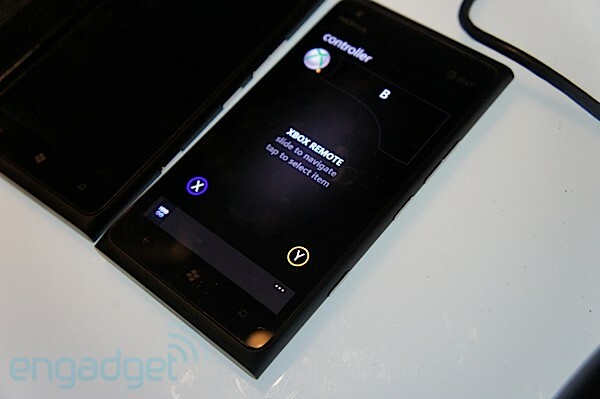 Oh yeah, and remote control functionality is built in as well, once you move over to the TV. Again, we're very much in the early stages here. SmartGlass is set to launch at some point in the fall, so we've still got a ways to go. There's lots of other functionality we've yet to see, like Web browsing, in which you use your tablet or phone as a keyboard for the TV-screen-based internet experience. Much of the functionality will also be up to the partners -- after all, Microsoft is trying to keep things open on its end and let the developers go wild coming up with new functionality. As far as partners go, MS says the content demoed is likely indicative of some of the launch partners, and we've seen some pretty high profile ones thus far, including HBO (Game of Thrones) and EA (Madden). And platforms? Redmond's still promising us the moon, including Windows on the phone and PC (duh), iOS and Android. Asked whether the latter two would be limited in terms of features, Microsoft sort of skirted the question, saying that that would be, "up to the partners." So, who knows on that front. All said, though, we've got what's shaping up to be an awfully compelling product here.